﻿﻿﻿﻿﻿﻿﻿The Capricorn Cetacean Research Team has just returned from an amazing 5 day trip to Repulse Bay and the Whitsundays. This trip had two primary aims. The first aim was to collect further information on ﻿the presence of the Australian humpback and snubfin dolphins in the region. This will support a future long term photo-identification project. 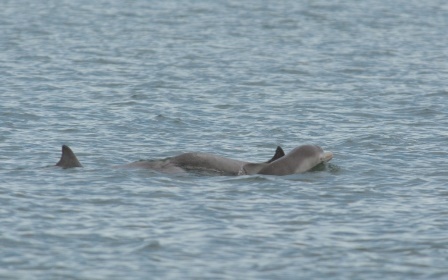 The second aim was to collect further biopsy samples to investigate anthropogenic contaminants in Queensland’s ﻿coastal dolphins. Repulse Bay may have repulsed Captain James Cook back in 1770 but the dolphins appear to have a completely different opinion. Although this region is particularly windy, once on the water the field site lived up to our expectations. During only one day of survey we recorded 4 groups of snubfin dolphins with a total of 36 different individuals. During the same survey we also observed 5 groups of humpback dolphins with a total of 31 individuals. 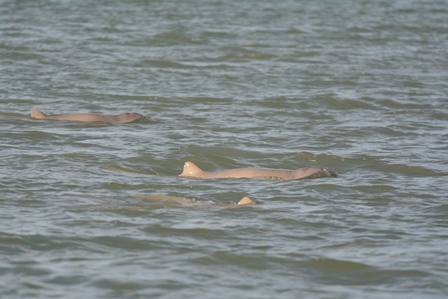 Despite the proximity of humpback and snubfin dolphins no direct aggressive interaction was recorded, suggesting that Repulse Bay may provide a great enough food source to sustain such large numbers of dolphins in a relatively small area. In comparison, sightings were lower in the north section of the Whitsundays with only 2 groups of humpback dolphins, with a total of 12 individuals, including a new born. We also had one group of 9 socialising snubfin dolphins. Within this group some individuals were observed mating on several occasions. 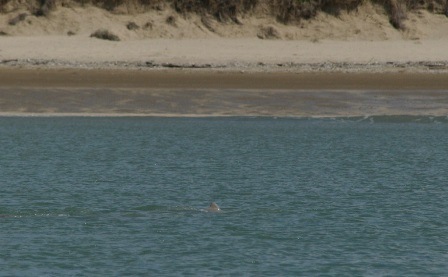 This group was later joined by 3 probable male humpback dolphins. During this encounter we observed Humpback dolphins actively attempting to interact with the snubfin dolphins. Throughout the entire interaction the snubfin dolphins maintained a tight group formation with only one large individual seen occasionally leaving the group to charge the humpback dolphins. 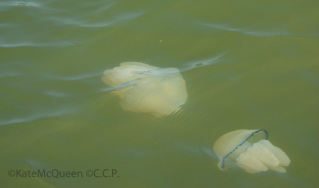 However, the interaction between the two species was not aggressive, but rather just a bit frenzied. Body to body contact between the two species was observed on several occasions, but we were unable to determine whether this contact resulted in a sexual interaction. After one month of training for the new Team Capricorn, the 2014 field season is finally started. The month of May has maintained its reputation of been unpredictable forcing Team Capricorn to spend most of the time working from home. Over the entire month we were able to complete 9 days of boat based surveys, just enough to cover the entire study area once. 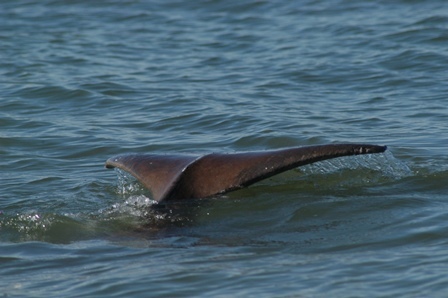 During these surveys we encountered 28 schools, 16 of humpback dolphins and 8 of snubfin dolphins. Schools of humpback dolphins varied in size from 1 to 20 individual (Mean ≈ 5 dolphins) whereas the largest school of snubfin dolphins was composed by 8 individuals (Mean ≈ 3 dolphins). Schools of humpback dolphins were composed by a similar number of adults and juveniles (Mean ≈ 2 dolphins) and to a lesser extent by calves (Mean ≈ 0.5 dolphins), 3 new born were also observed. 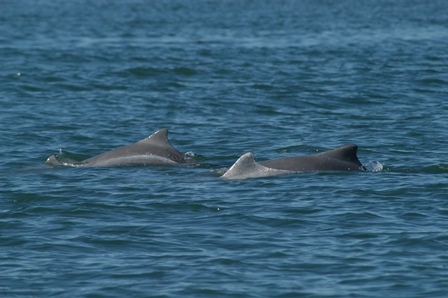 Schools of snubfin dolphins were composed primarily by adults (Mean ≈ 2), accompanied by calves (Mean ≈ 0.6) and juveniles (Mean ≈ 0.1), 1 newborn was also observed. Like for the MUCRU team in Western Australia It has been a busy start to the season for Capricorn Cetacean Research Project along the Queensland coast, winds mostly below 10 knots and sunny conditions…dream conditions for any researcher! 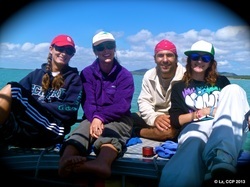 The new volunteers, Kelly (Washington, USA), Kate (Missouri, USA) and Letizia (Umbria, Italy), after landing from their long flights, had only few days of rest before embarking on the first of two, one-week expeditions to Broad Sound, an extremely remote bay in Central Queensland (Australia). Never before has there been a dedicated boat based survey for inshore dolphins conducted in Broad Sound. The primary aim of these expeditions was to identify potential critical habitats for Indo-Pacific humpback and Australian snubfin dolphins to increase our understanding of their abundance and distribution in Australian waters. Broad Sound is a large north facing V-shape bay, about 50 km long and 20 km wide. Tides flood toward Broad Sound from the north and from the south, resulting in a local magnification of the semi-diurnal tides by a factor of 6 compared to those elsewhere on the east Australian coast. The head of the bay has the greatest tidal range on Australia’s east coast reaching up to 9 m leaving all the creeks flowing into the bay (Styx River, St. Lawrence creek, Waverly Creek and Herbert Creek) entirely dried for most of the day. As a result of the high tidal range and turbidity seagrass does not grow in Broad Sound. Because of its isolation and limited accessibility, this bay can only be safely reached by water. The journey from Rosslyn Bay, 100 nautical miles south of Broad Sound, was long (14 hrs) but fun. In transit, we relaxed on board the slow but comfortable Adori, a 17 m ship masterfully streamed by its skipper John. While travelling toward our destination, the crew witnessed a large number of migrating humpback whales, which made for a very exciting first day. 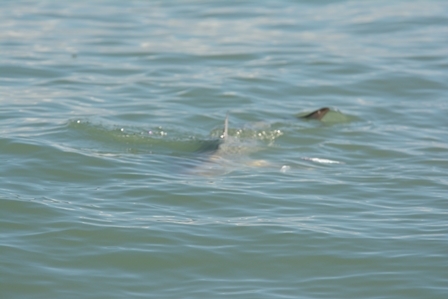 Thanks to favorable weather conditions we were able to complete 10 out of the 13 days with perfect sighting conditions. Over this period we searched on and off efforts for about 106 hrs and did almost 700 km of survey effort. During these surveys, a small group of friendly professional fishermen was the only human presence in the area. Unfortunately the results were not exciting; only 9 small schools of dolphins were sighted (including two resightings of the same schools), four of which were sighted on the same day. The most observed species was the Indo-Pacific humpback dolphin, with 6 sightings, while only 3 schools of Australian snubfin dolphin were observed. All records occurred north of the Styx River where waters are clearer and less affected by the strong tidal currents. Thanks to the team for their hard work, even though exciting events were few and far between. Special thanks to Adori, its skipper John and second in command Ginny, together with FBA representatives Tom and Shane, who provided a valuable contribution to this research through direct contribution to the fieldwork, logistical support and great food.